Inosensius Guido RH is an art and design aficionado. He views art as an optical tool to observe an object or phenomenon. He favors using that angle to set his viewpoints on the world around him. 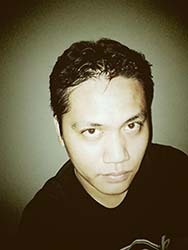 He lives in Jakarta and working as a designer. He is fond of photography and eager to capture amazing moment he encounters in every day life. Salam Jepret! The King Baka’s Palace contained a mixture of Buddhism and Hinduism influences. It was built on the 8th century, during Buddhist reign, and taken over by Hinduist Mataram Kingdom. 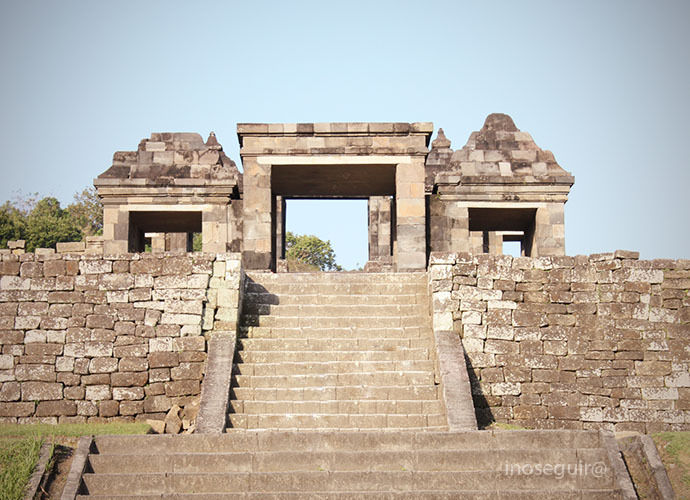 The site is called Candi Ratu Baka, meaning the King Baka’s Temple, on the contrary with the presumption that this is a shrine in honor of a queen or venerated female figure, as the word ratu means queen. The name comes from the Karatuan, or Kraton in today’s Javanese language refers to kingdom. Candi Ratu Baka is a unique Hindu site in Java island for its debatable history. Although this site is largely considered a temple, historians argued that this was actually a palace which had a fortification system, although no one challenged that this was once a temple. The findings of stone walls and trenches arond the site supported this opinion. Constructed over 200 meters above sea level, this site was arguably a formidable defensive post which had taken the advantage of higher land. Discovered by Dutch archeologist HJ de Graaf in the 17th century, most of the structure were already in ruin, but some part remained intact, like this folk creature statue. 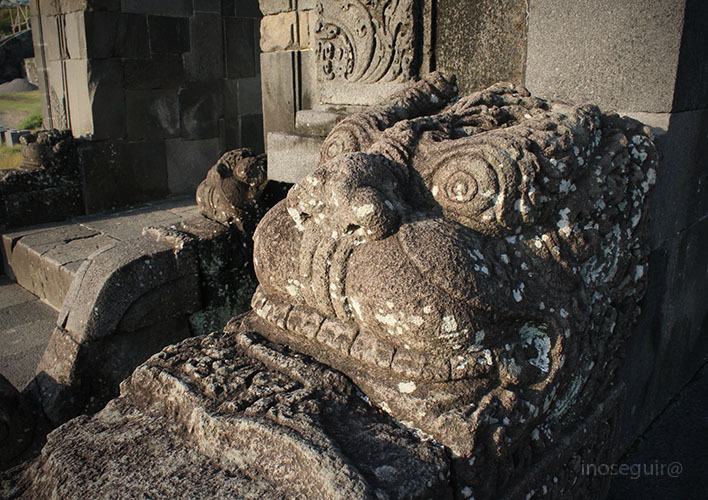 It took one hundred years after the first documentation by Van Boeckholzt in 1790 to delve into a possibility that Candi Ratu Boko was a palace and a fortress. In his findings titled Keraton van Ratoe Boko, FDK Bosch made the first critical assesment about this as he inspected the elements that interestingly formed this site. Not only shrines, altars and even a well spring, there were also found evidence on the total size of 25 hectares of historical site that this holy complex was also the ruins of a palace, such as residing places, water reservoir, and fortress. While visiting Yogyakarta, Central Java, a prominent cultural city in Indonesia, Candi Ratu Baka offers an alternative ancient site besides the already a global name Candi Prambanan, a UNESCO World Heritage Site, two kilometers apart. 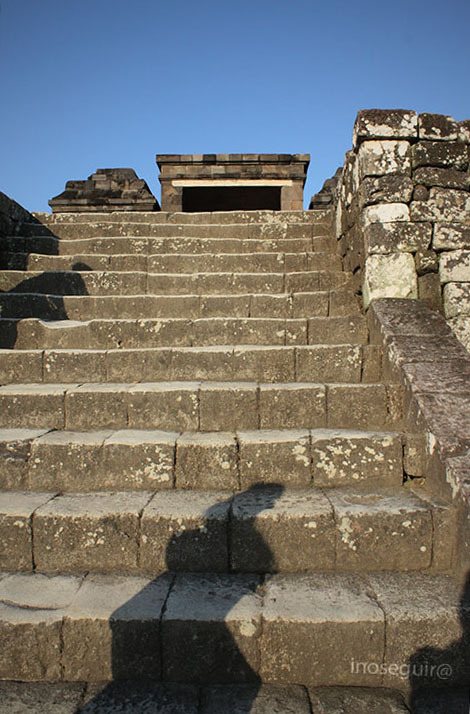 Staircase to a worship altar, which suggested the remaining element of a temple, before it was transformed to a fortified palace.